NRA Hunters' Leadership Forum | Heading for the Hills? Beware of Dehydration! Heading for the Hills? Beware of Dehydration! It’s that time of year again as everyone finds out if they drew a Western big-game hunting license. Many of these lucky hunters will be heading our West this fall for their first high-elevation hunt. Now is the time to prepare. You may think I’m referring to tuning your bow, zeroing your rifle or taking inventory of your clothing and gear. While that’s important, too, I’m talking about something that may be even more critical to the success of your hunt: preventing dehydration. One thing I realized over the years, whether I was outfitting and guiding big-game clients or showing hunting ranch property for Hayden Outdoors, was that clients who came from sea level or minimal elevation were used to areas that were much more humid compared to western states. When experiencing the West’s lack of humidity for the first time, the hunters didn’t stop and think about why they didn’t get soaked with sweat during a climb. With humidity lower at higher elevation, sweat evaporated so quickly that they didn’t realize they were sweating or how much water they were losing through physical exertion. Compounding the problem, the lower oxygen levels at high elevation made them breathe more rapidly and deeply so they lost even more water through respiration. Despite being reminded to keep sipping on that water bottle, by the time they felt thirsty, they were already dehydrated. And the clients who were in the best physical condition for a rugged Western hunt surprisingly were most often the ones hit hardest because they were able to move faster and climb higher despite the thinner air at higher elevation. According to the Wilderness Medical Society, you lose water through respiration at high altitude twice as quickly as you do at sea level. High altitude also can make you need to urinate more often and can diminish your thirst response, putting you at even greater risk of dehydration. The International Society for Mountain Medicine considers high altitude to be between 5,000 and 11,500 feet. It defines very high altitude as between 11,500 and 18,000 feet, and extreme altitude as anything higher than that. Medical professionals explain that the higher the elevation, the greater the effects on our bodies, making it more important to stay hydrated compared to the amount of fluids you’d drink at lower elevations. You can have mild, moderate or severe dehydration, depending on the amount of water loss. Once you begin to lose more fluids than you dare drinking, your body can’t function properly. That’s when you are prone to experiencing fatigue, light-headedness, loss of appetite and more dangerous conditions such as heat exhaustion and heat stroke depending on how much fluid is missing from your body. How Does Dehydration Impact Altitude Sickness? Dehydration can be serious, but it also can conceal and/or increase the symptoms of altitude sickness. On one of our hunts, my wife experienced this firsthand. Sometimes linked to dehydration, altitude sickness can be life threatening, particularly at altitudes greater than 8,000 feet. But at minimal and moderate altitudes, dehydration is responsible for more illness than oxygen insufficiency. Dehydration and altitude sickness both can cause nausea, headaches and fatigue. However, drinking more water will not get rid of altitude sickness. The only way to cure it is to drop to a lower altitude. The Institute for Altitude Medicine (IAM), advises people to drink an extra one to one and a half liters of water daily when at high altitude. At altitudes above 10,000 feet, it also recommends increasing your intake of carbohydrates. It says adult men need about 13 cups per day of fluid and adult women need about nine. (The IAM says you get an additional two and a half cups of fluid from foods.) In step with the IAM, the Wilderness Medical Society recommends drinking three liters (13 cups) to four liters of liquids daily that contain 200 to 300 grams of carbohydrates. Accounting for variations in physical stature, both sources say that a good way to make sure you are hydrated is to check your urine. If it is dark rather than clear or light yellow, you are dehydrated and need to drink more. The IAM and websites such as High Altitude Life explain that the signs of dehydration include: fatigue, light-headedness, loss of appetite, shortness of breath, headaches and more dangerous conditions such as heat exhaustion and heat stroke, depending on how much fluid is missing from your body. Once you are 6000 feet above sea level, you exhale and perspire twice as much moisture. What Can’t Be Emphasized Enough? Avoiding dehydration has to start at the beginning of your hunt—not at the end—because once you’re thirsty, you’re already dehydrated. Try to arrive at your high-elevation locale at least a day in advance to get acclimated. Start drinking water immediately. At higher elevations, the onset of dehydration can occur within several hours. Fortunately, it is usually preventable. 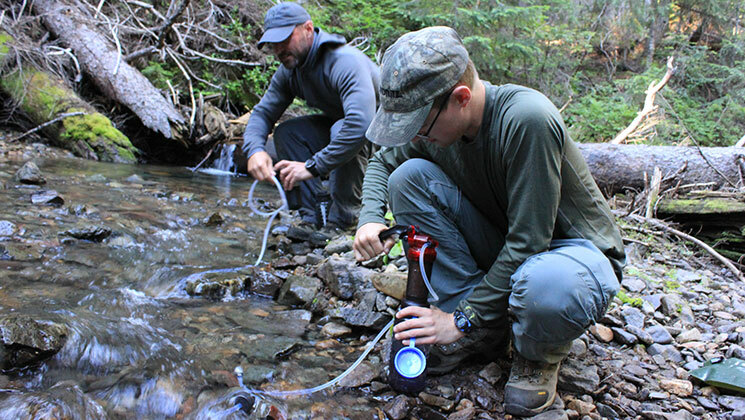 So when it comes to those high-elevation hunts, whether chasing bugling bulls in Montana or high-country mule deer in Colorado, staying hydrated is a key to success. Hydration keeps your reflexes sharp, allows your body to cool down in the heat and helps your muscles and joints to work properly while clearing toxins from your kidneys. The higher the elevation, the more water you need. The reward of your diligence just may make the difference in you leaving the mountain with an ample supply of nutritious, high-protein, low-cholesterol game meat for you and your family. About the Author: Phil Phillips began guiding hunters at age 18, and in his early 20s started Colorado's first Ranching for Wildlife Program for antelope, which he ran for the next 15 years. During this time he was named SCI's North American Bowhunting Outfitter of the Year. For years he has hosted, hunted and guided hunters on outdoor TV shows on the Outdoor Channel, Sportsman Channel and the Pursuit Channel. Phil has spent his adult life hunting and leasing land across the Rocky Mountain West and Kansas and is a broker for Hayden Outdoors, the West’s largest farm, ranch and recreational real estate brokerage. Phil is a Life member of the NRA, Safari Club International and the Mule Deer Foundation and has taken 56 game species across 11 countries and seven Canadian provinces. Contact Phil at phil@haydenoutdoors.com.